One brilliant essay, dense with gravity and shrewdness, on Walter Benjamin: "The melancholic sees the world itself become a thing: refuse, solace, enchantment." A depredation of Leni Reifenstahl's fascist aesthetics--with some significant revision by Sontag re "camp": "The hard truth is that what may be acceptable in elite culture may not be acceptable in mass culture, that tastes which pose only innocuous ethical issues as the property of a minority become corruptions when they become more established. Taste is context, and the context is change." A pair of fond, sleek envois--to Paul Goodman, to Roland Barthes. And three sacks of cement: lumpy, slow-setting impactions around Artaud, the German film-maker Syberberg, and Elias Canetti. With Artaud, Sontag can go only as far as the obvious limitations of the work allow: the mad Frenchman's pain, radical unentertainment, and turgidity (although Sontag does not see madness--or any illness--as an excuse for us to distance ourselves from the thought thus enveloped). But to some degree on Canetti, and wholly about Syberberg, Sontag wields a bludgeon. Is Syberberg's film on Hitler a Symbolist/Surrealist dysutopia or "moral or cultural science fiction, Starship Goethe-Haus?" The ratified categories Sontag sometimes comes up with are boggling; the polymath qualities she admires so in her subject are precisely those which she herself shares, splendidly--yet hanging over these Europhile appreciations is a thick carapace of opacity and respect solely for the total art object (intellectual Syberberg's, not unintellectual Riefenstahl's) that beetles as much as Artaud's unreadable ravings. Sontag's prose is clear, her mind amazingly nimble--and her points of concentration alas, targets for Teutonic heavy-armor fire. 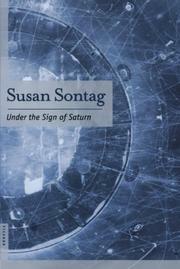 More so than most Sontag--of distinctly limited interest.